Identification of right carburetor requires complete knowledge about every carburetors that is being offered by the company. While identifying the right one, you need to be sure that important points related to different carburetors are collected. You need to make sure that you have got the right model so that you can quickly refer to the quick reference table. When manufacturing model number matches with the Part number you are able to fetch correct details about the carburetor. Tecumseh carburetor is one of the best small engine carburetor being made. In order to ensure smooth and long lasting performance, make sure that the carburetor is correctly identified and then service and troubleshoot the issues. 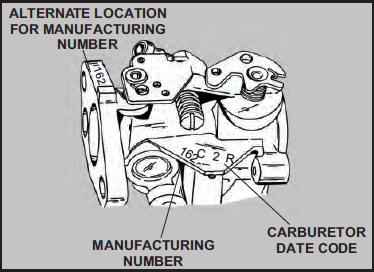 Tecumseh carburetor are stamped with the Manufacturing Model Number and date code. Below is a quick reference table to match your carburetor’s Manufacturing Model to the Service Number. This is essential if you want to find the part of your carburetor, or to find lower assembly component parts. Further down you will also find Carter, Marvel-Schebler, Tillotson, Walbro and Zenith Carburetor manufacturer’s models and their corresponding Service Number. This will aid you if you own a Engine with a non-Tecumseh carburetor Identification. Once, identified correctly, you can do so many things such as replacement of parts, repair, maintenance and troubleshoot. We provide clear and neat diagrammatic description for better and smooth understanding.